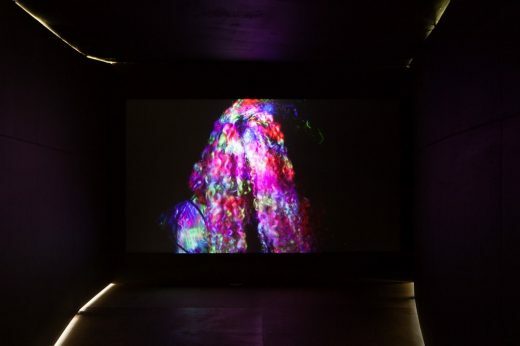 The pavilion exhibits a video art piece from the 32ª São Paulo Art Biennale by Bárbara Wagner & Benjamin de Burca. 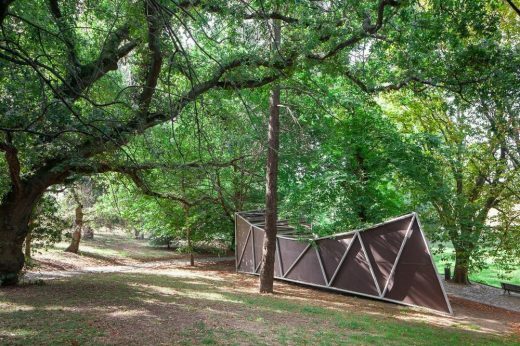 Surrounded by the gardens of Serralves in Porto, FAHR’s structure is an architectural object that explores the ambiguity between the presented work and its context. Inspired by this duality, FAHR designed an object that proposes an intriguing dialogue between architectural scale and the natural setting of Serralves. 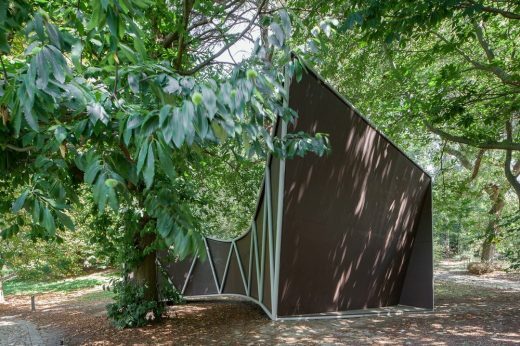 The pavilion softly stands supported by only two points that subtly connect with the natural surroundings, thus underlining the park’s topography, vegetation, and meandering paths. 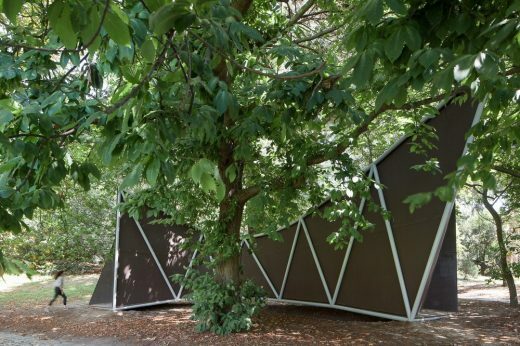 The piece challenges the traditional approach to temporary pavilion design. Its shape is equal parts seductive and harmonized with the natural context. 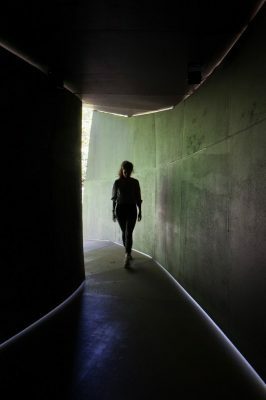 The pavilion invites the visitor to enter by letting in snippets of daylight that lead into a sheltered path of increasing quietude. 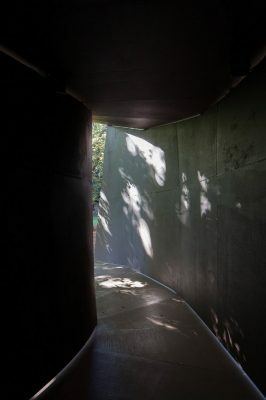 Step by step, the rich vegetation of the park is left behind until the visitor reaches the video display which can be enjoyed in quiet and secluded darkness. 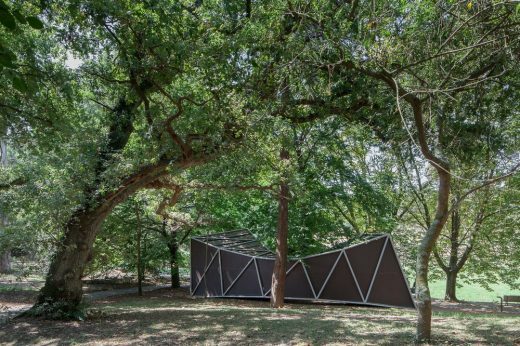 On the whole, the pavilion strikes a balance between seamless integration with the lush vegetation of the Serralves Park and providing a perfect display for the video-piece. FAHR 021.3 is a collaborative practice working in the intersection of art and architecture. Based in Porto, the studio was founded by two architects, Filipa Frois Almeida and Hugo Reis. The duo explores the language and methodology of architecture applied to unexpected locations and materials. Their work comes in a variety of forms, including installations, site-specific art, performances, and interventions.